Guys, only a few weeks before my new cookbook, Skinnytaste One and Done comes out!! If you pre-ordered, don’t forget to fill this form out download the 40-page bonus pack today which includes 3 exclusive recipes that will never be posted on my website. 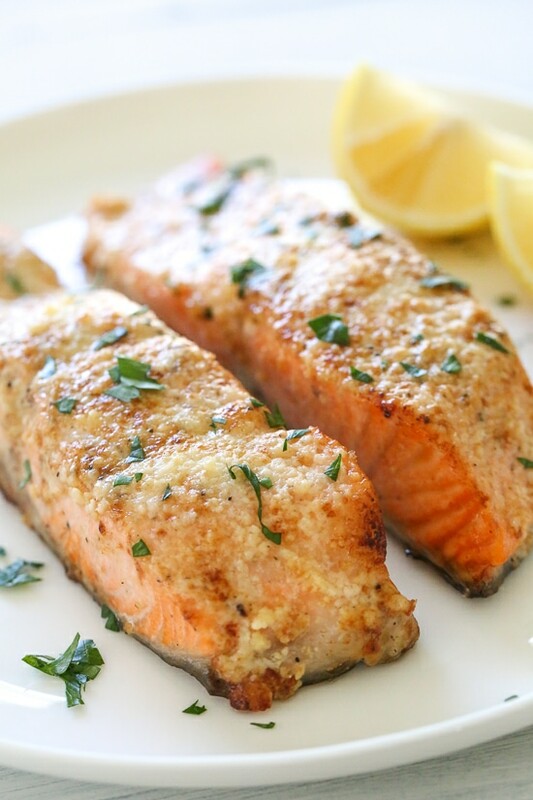 One of them, the Air Fryer Parmesan Salmon is included in this weeks meal plan, so you will need the bonus pack to make it! B: ⅓ cup quick oats (3) with 1 teaspoon honey (1), ½ cup blackberries (0), 1 tablespoon skim milk (0), 1 tablespoon chopped pecans (2), pinch salt. ***Green salad includes 6 cups romaine, ½ cup each: carrots, tomatoes, cucumber, and 2 scallions. Love the recipes and meal plans. I have told several friends about your recipes and now “which Skinnytaste recipe have you made lately” is a frequent topic of our conversation. My family enjoys the variety and we are trying foods we usually haven’t eaten. Thanks! Thank you so much for all your meal planning! I’ve been wanting to try them for a long time but my doctor has had me on a low carb diet. He just gave me permission to try them so I’m going to start in a day or two! Thank you so much for these wonderful meals. Me and my family have been eating them for the last month. I have lost 10 pounds since I have started this. All the meals are wonderful! I love that you take the thinking out of the meal planning for me. It works like a charm!!!! Once again thank you!!!! I just subscribed to your newsletter. Your content is GREAT! Pleeease keep posting these meal plans. I can’t imagine the work you put in to creating these, but they are so, so helpful! Thank you Gina! Our family has fallen off the horse and resorted to fast-food on the way home. 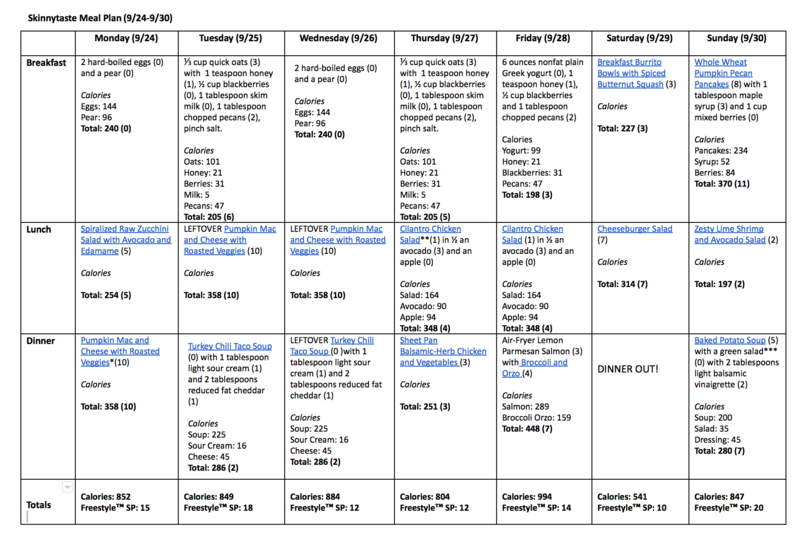 I’ve used your meal plans in the past and am planning to start again this week. It is completely up to you! You can plan your grocery list accordingly for the week and cook the meals day of or ahead of time and refrigerate or freeze them like some do depending on the recipe. It is completely up to your own design and what works for your schedule. Hope this helps. I love the meal plans! This weeks plan looks Amazing! I’ve allowed myself to get sidetracked from my goals and I’m so excited to jump back into it. Your menu plans are so helpful and it’s nice to see I can still have some of my favorites (pancakes!) if I find balance in other parts of my day. Thank you for all the hard work you put into these. Omg the pumpkin Mac and cheese is amazing!! My daughter is even eating the spouts which is a first!! I am looking forward to getting your new cookbook! I don’t consider myself a good cook, but I sure do seem like one when using your recipes. Tonight I tried the lamb loin chops included in the free preview, although I cooked them in my air fryer along with some Delicata squash. We were in awe of how much we liked them! Thank you! I was feeling overwhelmed by the week and what I needed to plan for dinner. I had jumped on your site searching for individual recipes, but found this week-long plan instead. I just finished prepping tomorrow’s meals. Thank you, thank you!! I am so glad they are helpful! I love your meal plans. They always inspire me to make one of your recipes. Your cookbooks are also inspiring, but the meal plan is a weekly reminder of a recipe I may have overlooked. Please keep sharing! I’ve been looking for something that will just tell me what to eat, your meal plans, lists, recipes are perfect. Please keep doing the meal plans !!! You make my life soooo easy thank you soooo much !! I find the meal plans really helpful. Please keep doing them, and I like getting them on Saturday morning. For two of us, a retired couple, I almost always use two or three of the recipes, not all, and the “wiggle room” is much appreciated. Substituting cauliflower for potatoes and butternut squash as part of a sauce helps us control the calories without sacrificing flavor and taste. Thank you, Gina! Thanks Gina! For the breakfast on Tuesday ⅓ cup quick oats (3) with 1 teaspoon honey (1), ½ cup blackberries (0), 1 tablespoon skim milk (0), 1 tablespoon chopped pecans (2), pinch salt. Are the quick oats already premade with water? No, it’s dry so you would cook it. Sorry to appear dense- but how is it cooked? Quick question! The Airfryer Salmon recipe says to preheat air fryer to 400, but to cook at 425. Do I turn it up to cook, or is one temp correct and the other wrong? Everything looks delicious. Can’t wait for the air fryer salmon! Bon appetit and thank you again, GINA! I pre-ordered your new cook book. Can’t wait to get it. Unfortunately above link is broken. I get a blank page. The parmesan salmon sounds delicious. This just might be my excuse to purchase an air fryer. Gina, I made your Air Fryer Lemon Parmesan Salmon tonight for dinner after preordering your cookbook. Absolutely delicious!!! It was also the first time I cooked something in the air fryer and I was so happy with the results. I cooked it up with some roasted broccoli and harvest grains from TJ’s, and there were absolutely no leftovers! That doesn’t happen often. Thanks again for so many amazing recipes! Your site is my go-to for reliable delicious food! Great!! I love making salmon in the air fryer, glad you liked it! Love your meal plans. Makes life so easy and healthier. Thank you for sharing. Love all your recipies. Thank you Gina! We all appreciate your efforts. Gonna go shopping tomorrow. Thanks for This! It helps me plan my week out sobim not guessing what to make for dinner and adds a healthy variety to our meals! 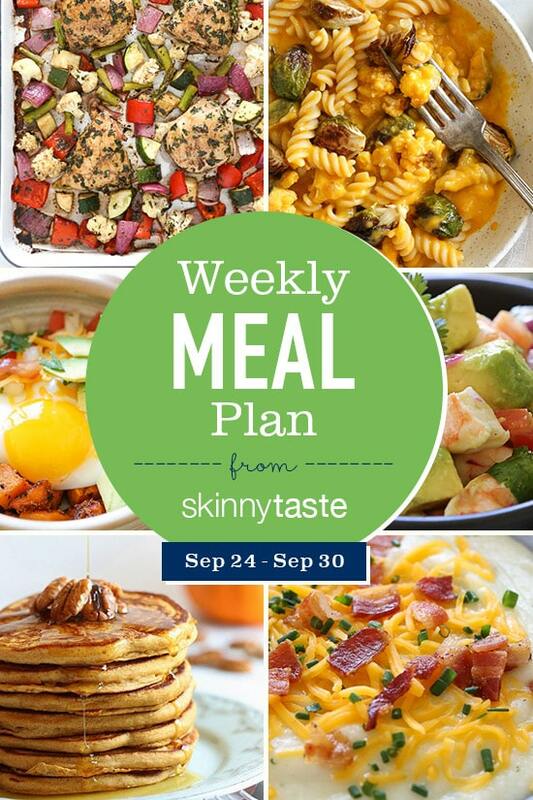 I’m looking for something new to do for meals next month, so I’m excited to try your meal plans! It’s a nice change from our normal meal planning routine. Quick question: on average, about how much would you estimate the cost is for groceries each week? Printed off the list and heading to the store! Thanks! !